FREE Pick for Tuesday, May 29, 2012. LA DODGERS -121 over MILWAUKEE. In 2011, Bob produced an overall win percentage of 66%, +138.11 units, and a profit return of 276% over a five month period. Click on 2011 Final Results to see every wager made in 2011 for all five systems. If you're interested in getting more information, check out Bob's Picks. If you've new to baseball betting, you may want to check out How to Bet Baseball. They'll explain what you need to do to place bets on baseball in no time. Also, we suggest that you read baseball betting lines, which explains the most popular types of bets on baseball. In addition, check out Sports Betting Terminology in case you see a word or two that you haven't seen before. Most professional gamblers agree that baseball is one of the best ways to make money since it is one of the easiest sports to handicap. Many sportsbooks (both online and Nevada) would prefer to close their doors during the baseball season. How to Choose a Handicapper. 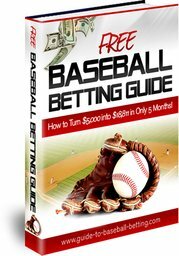 You can also check out all of the free articles on selecting the right sportsbook, how to pick a baseball handicapper, how to read baseball lines and odds, and how to develop your own strategies for picking winners and protecting your baseball profits. And more at Free MLB Picks.